Excellent in a hanging basket Sedum morganianum with its trailing long spiral leafed stems is reported as a ‘little tricky’ to grow, however it is well worth the effort as it makes an attractive indoor plant. This is a slow growing plant, it can reach 4ft (1.3m) in length, and when fully grown it is an eye catching plant. To reach this size may take up to 4 – 5 years. One issue the plant has is that the leaves fall off very easily, so it is best positioned in a plant where it is not easily knocked and does not need to be moved. Good drainage is the key as Sedum morganianum is a little prone to rotting in damp soils, it is after all a succulent. So if we avoid overwatering we are half way to success. The second tip is to avoid any position where it can be knocked or is subject breezes, it does tend to drop its foliage easily when knocked. Unlike most plants, we do not recommend repotting, if it is happy, leave it alone. Chances are the trailing fronds will drop off and you will be left with a stump. Active growth is from spring through summer and this is usually the only period where they need watering. Sometimes the small green ‘jelly bean’ like leaves will drop off to leave a bare stem, they will re-sprout. Propagation is from cuttings (or the bits that break off). Remove some of the leaves so you have a bare stem about 5cm and 5 cm of foliage. Leave the cutting to harden for 2-3 days. And you are ready to plant out. Fix the stem into a regular succulent potting mix. You may need to pin it down with a bent wire to hold it in position. Remember not to over water. You can also grow from individual leaf cuttings, simply push them a little into the soil and they will usually strike easily. Botanical Name – Sedum morganianum. 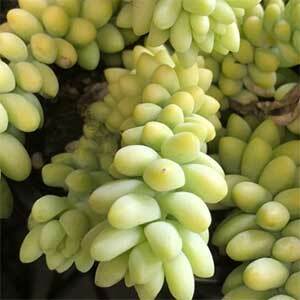 Common Names – Donkey’s Tail Sedum, Sedum Burrito, Burro’s Tail. Position – Warm position indoors or outdoors. Position Sedum morganianum away from walkways and breezes. Soil – Use a cactus and succulent potting mix. Height -This is a trailing plant and stems can reach to nearly 60cm in ideal conditions. Keep away from cold drafts. Q . Is Sedum morganianum poisonous to cats and dogs ? A. No, according to the American Society for the Prevention of Cruelty to Animals this plant is non toxic to cats and dogs. Q. Why does my Donkey’s Tail Sedum have yellow foliage? A. Most likely it is not getting enough light. A second issue is over watering. Q. Why are the leaves falling off? A. Usually because of overwatering, under watering or lack of light. Some leaves will fall off naturally, excessive leaf loss is a problem.